Whether you are familiarizing yourself with the language, or planning a trip to the new republic of Ukraine, this is the phrasebook for you. For business, education, or leisure, one must realize that this area once part of the former Soviet Union has a culture and language that is quite different from Russian. 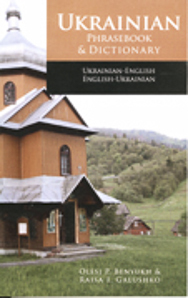 This language guide prepares its reader with fifteen chapters of situational phrases suited to: traveling by rail, trolly, car or bus; coping with emergencies, Ukrainian shopping; exchanging currency; getting along at a hotel; ordering a meal, and other daily life adventures. Each Ukrainian phrase is accompanied by an English translation and phonetic pronunciation based on North American speech. For handy reference, included is a 3,000 word mini-dictionary listed in both English and Ukrainian. With its countless tips to facilitate living, traveling and working in Ukraine, this is an essential and indispensable item for the traveler.